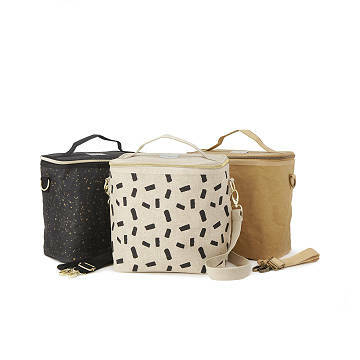 These insulated linen and paper blend bags keep your lunch cool and your style cooler, in 3 neutral tones. Remember your grade school lunchbox, covered with cartoon characters? Sweeeeet...for a ten-year old. But now you need grown-up lunch bags like these to complement your professional style. The outside is a washable linen or paper blend in three sophisticated, neutral colorways. Inside, they’re fully insulated, with a removable internal compartment, also washable, for tucking in bowls and jars filled with whole grains, fresh fruits, and leafy gree—cough—fancy cookies (or is that just us?). Clip on the matching strap to carry them crossbody-style, and add the optional ice pack for extra cool. Choose Kraft Paper, Black Spatter Paper, or Linen. Made in China.